In an ongoing effort to clear out clutter and simplify things even more around here, I have not been allowing myself any trips to the thrift stores in town since before Christmas (the one I went to while we were in Maui doesn't count, it is obviously exempt from any such ban as we were on holiday then and that makes everything O.K). Since I have cleared out most of the excess from my laundry room – now to be known as the creating room - I thought it might be time to lift my self-imposed ban. After all I had fixed two of the hand-me down sewing machines and now I needed some inspiring fabric to create something with. Besides that, we are headed to Vancouver and I love the thrift stores there, a ban was simply out of the question. So today I was heading into town for our weekly homelearners get-together and decided that we would have a look. We went to a store that I am slowly becoming disenchanted with as I find they are getting more expensive, when I thrift I want to find serious bargains, I want treasures for 25 cents, you know? So $5 for jeans doesn't do it for me, $3 is my max. usually. I like to find balls of yarn for 50 cents - although I am willing to pay $1. So imagine my surprise when I willingly paid $7.50 for a roll of fabric(O.K, it was 5 metres, but still), and $5 each for 2 boxes of thread. A king's ransom for such things really, but the fabric was just right for the cover I have been wanting to make for an old manky footstool that I have had sitting around for years. 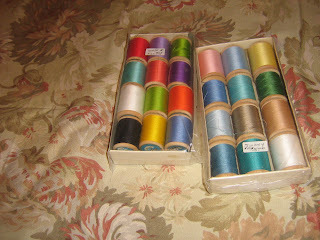 The boxes of thread had 12 spools each of lovely colors and they were wooden spools, which are what we always had when I learned to sew, and I convinced myself that I could do something with the spools after I had used up the thread. I had to think long and hard about getting these items as they were much more than what I would normally pay at a thrift store, and then some little voice in my head said, "Get a grip woman, not only would they cost way more new but you actually would have to take the boys to the fabric store….the dreaded fabric store and search through row upon row of fabric." Now I can tell you that not only is that not appealing to my boys but strangely, it is not appealing to me (many a Saturday and week-days after school I spent following my mom around fabric stores and I still remember very clearly how much I loathed it. In fact I still tease her about my hard-done-by-childhood today). Actually I have to admit that I also heard my husband's voice inside my head saying "Get a grip woman", as well, except he didn't say it nearly so nicely. I tend to drive him round the bend with my thriftiness sometimes. So I decided to ante up and get the goods. I did get a wool sweater to felt for $1.49 though and another roll of fabric for $1, so that made up for it. And since I had so considerately saved my poor boys from a trip to the dreaded fabric store I figured they could deal with a quick hit at one more thrift store. This is a store where great yarn bargains are to be had and I found all of these lovely hoops, with which to do this, and won't that make my cleared out laundry....er... I mean, my creating room look lovely. wow!!! WHAT a find! good for you for snapping it all up. LOVE the wooden spools, and the hoops will really transform your room. what a great idea! Waaaaaah! You. Were. The. One. 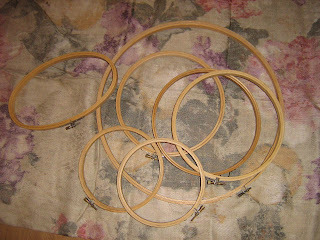 I wondered where all the wooden hoops had gone. Rats! That's what happens when we get ideas from the same websites. Seriously, though, great thrifting finds. You're still the Queen!